Unlike some speculative authors, Friedmann comes to the topic with solid credentials as an aerospace engineer and a businessman. With a master’s degree in engineering physics and more than 20 peer-reviewed scientific papers on space industry topics and cosmology under his belt, he is also the CEO of Canada’s leading aerospace company (which built the famous Canadarms for the Space Shuttle) and is actively involved in both space exploration and the Hubble telescope. 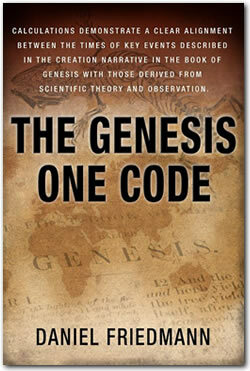 Backed by his full grounding in engineering and space exploration, Friedmann’s “Scale of Origin” discovery has finally unlocked the scientific explanation behind Biblical creation in The Genesis One Code. Amazingly enough, there is an alignment between what scientists are saying about creation and what the Bible says. It is a rare joy to be able to help a client prepare a manuscript for something so important and groundbreaking as this. The 2013 Readers’ Favorite 2013 International Book Award Winner and Finalist in the 2013 National Indie Excellence Awards is available free-of-charge for 3 days only: Click here to get your free copy.